Defaulting on a loan is the failure to live up to the terms of a contract. It is the breach of a promise to pay a financial obligation, such as a mortgage or some type of loan that is supposed to be paid in certain amounts at certain times. For consumers, it is the default on a loan taken out personally by a consumer. From a corporate perspective, a default is a failure by the corporation to pay the interest, principal on a bond, or other debt security owned by the corporation’s debtholders. A default on a loan obligation is serious and can affect the creditworthiness of the individual or company that defaults on the loan. To default on a loan or a contract is an important matter. If you take on debt such as a mortgage, credit card debt, a student loan, or some other type of personal loan, you sign a contract. A contract is a legal document that binds you to the terms stated in it. Most consumer loan contracts will state that legal action will be taken against you if you fail to pay, or default on the loan or contract you sign. If you default on a loan such as a personal loan or credit card, you will face consequences including late fees, being reported to the credit bureaus, collection procedures, and lawsuits. If you default on your automobile loan, the car can be repossessed. If you default on a loan like a mortgage on your home, the bank can force you out of your home and foreclose. Any defaults on a loan can lead to wage garnishment which makes it very difficult to pay for the demands of your life. If you default on a loan, it will show up in your credit history and be reflected in your credit score. Your credit score will decline and it will be very difficult for you to get credit in the future. Defaulting on a loan can even push you into bankruptcy. Defaulting on a student loan can follow you into retirement by lowering your social security payments and taking away any tax refunds. If you have a credit card and you stop making the payments, you are violating the terms of the contract or agreement you signed when you received the loan or credit card agreement. Defaulting on a credit card loan means that, at first, you will be assessed late fees for every month you don’t make a payment. After you miss two minimum payments, which is generally at the 60-day mark, your annual percentage rate (APR) will go up. When your APR goes up, it increases the amount you owe along with the amount of the late fees. At this point, your delinquency in making payments will be reported to the three major credit bureaus. Your credit history will reflect your late payments and your credit score will be impacted. You will receive telephone calls attempting to collect the debt. You have now built up many hundreds of dollars in late fees and penalties. It is possible that after 90 days, the credit card company will send you a settlement offer. If you don’t make arrangements to settle with the credit card company and six months passes, you are assumed to be in default on the loan. The credit card company may charge off the loan as a business loss and turn your account over to a collection agency. Your credit history and credit score are severely and adversely affected. You may be sued or forced into bankruptcy. A default on a personal loan that is not a credit card loan may be different depending on if the loan is secured by collateral. If a loan is secured by collateral, then your personal property that you purchased with the loan can be taken by the lender. Along with the loss of your personal property, you will suffer the damage to your credit score just like if you default on a credit card loan. Automobile loan – If you skip more than one payment, you are in danger of having your car repossessed by the lender. It will be sold at auction and if it is sold for less than you owe, you will be responsible for the difference, plus expenses, or you will likely face a lawsuit. Mortgage loan – If you default on a mortgage loan, you are in danger of losing your home. 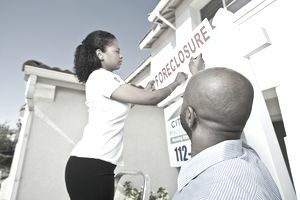 Before the bank or lending company can foreclose on the home and evict you, they have to file a document with the court. This is called a Notice of Default. After this notice is filed, you can either make an agreement with the lender or bring your mortgage up-to-date by paying the delinquent payments. If you can’t take one of those options, the home will be foreclosed and you will be evicted. Depending on state law, you may still have to pay on the home if it is not sold for enough to pay off the loan. You may also be liable for expenses. Student Loan – Student loan debt is a heavy burden. Student loans lenders are typically very forgiving when it comes to working out a payment plan if you find yourself in a time when you aren’t working. There are programs for loan forgiveness, payment deferral, and forbearance. If you default on a student loan, it can plague you all the way to retirement. If you default on a loan, lenders can take a number of actions against you that can ruin your credit and cost you money right up to retirement. Rather than default on a loan, it is always best to work with the lender to find a solution.